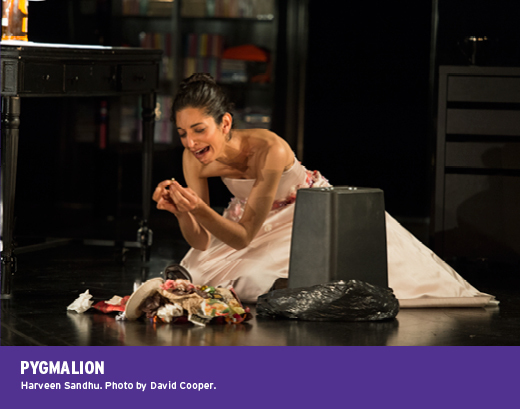 Every great festival needs hits and the Shaw has found a splendid one for this season in Pygmalion. Director Peter Hinton has brilliantly updated Bernard Shaw’s classic play of class and language, bringing the ideas and characters forward a century, without losing the work’s insouciant wit and satiric bite. 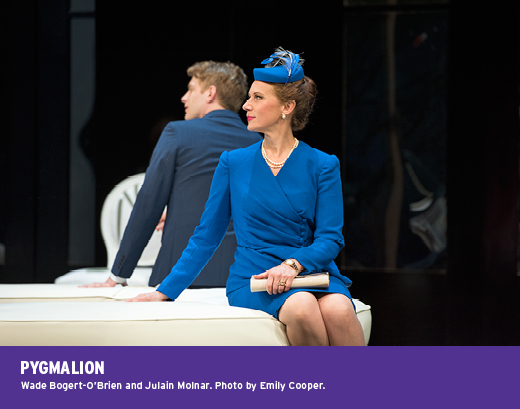 Act One is breathtakingly different from older versions of Pygmalion. We’re in Covent Garden circa 2014, not 1913. Eliza Doolittle, the famously Cockney flower girl, is now a mixed-race South Asian Brit, and a very modern London “guttersnipe.” Calling her that name and worse is Henry Higgins, no longer an imperious professorial type. He’s a bike riding, casually dressed techie nerd who uses an IPad for recording local dialects, not a notebook. The gang of urchins at the Garden is made up of African, Caribbean and Asian youths as well as Caucasians, wearing sneakers, t-shirts and tight jeans. They seem a good deal more menacing than the denizens 100 years back. Updates continue as the scene changes. When Eliza comes to visit Higgins the next afternoon, she doesn’t enter a book-lined den. The very model of a truly contemporary scholar, this Henry Higgins has video monitors everywhere and computers with up-to-date sound recording devices. The sparring around language, with Higgins vowing to make Eliza pass for a duchess in six months, is enhanced by modern technology; it makes it far easier to imagine how a flower girl can be transformed to someone resembling a member of the aristocracy in no time flat. Video footage shown during scene changes informs the audience that the class system is more fragmented than one hundred years ago. The rich are richer, as Hinton notes in his director’s notes, and there are more poor people than ever. A BBC video states that there are now seven types of class one can belong to including “emergent service workers,” who have very little money but still love culture and have lots of friends. Where do Eliza and Henry fit in? The contemporary Mrs. Higgins is a Vivienne Westwood-type, who runs a fashion salon, with very hip models who would fit neatly into a rom-com or a reality TV show. She moves easily between the classes in ways that her son can hardly fathom. It’s to Mrs. Higgins that Eliza flees after her confrontation with Henry—and her move makes more sense than ever given Mrs. Higgins nearly class-free surroundings. Fine, you must be thinking, but what about the play? 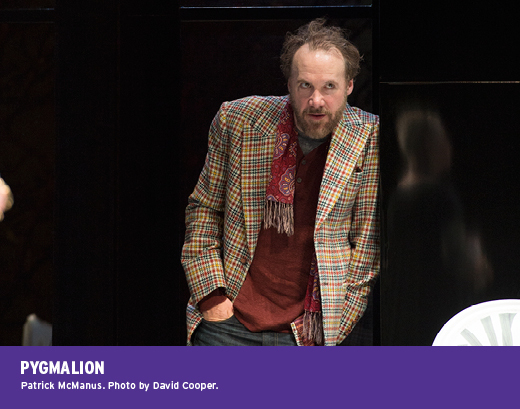 Pygmalion is still wonderfully witty—and perhaps more relevant than ever, especially in England, where dialects can be more easily traced than in Canada. 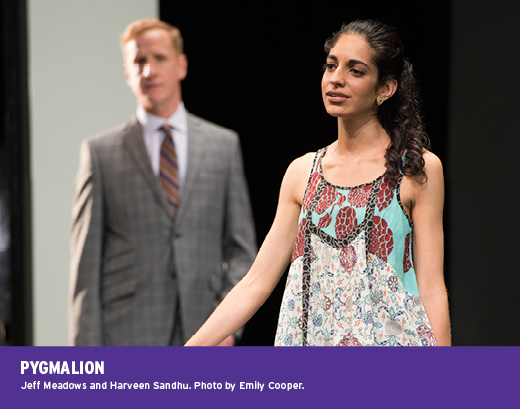 Perhaps Hinton’s biggest coup is in casting Harveen Sandhu as Eliza. She’s terrific in the role, making the shift from flower girl to “duchess” believable and beautiful. The cast, in fact, is uniformly fine, apart from Patrick McManus, who doesn’t succeed in making you forget that behind Higgins’ rudeness is a teacher and a democrat, who really wants Eliza’s rise in class to be real. 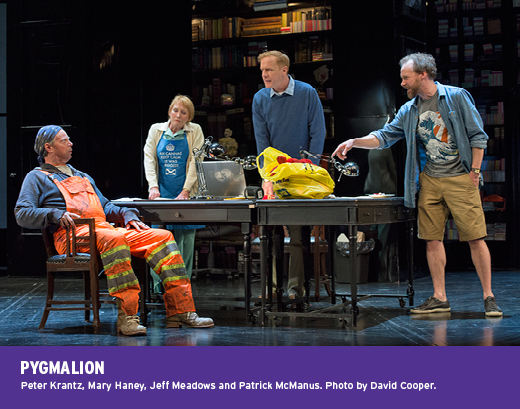 Still, this Pygmalion is, over all, a grand success, one that audiences will keenly enjoy this year at the Shaw Festival.